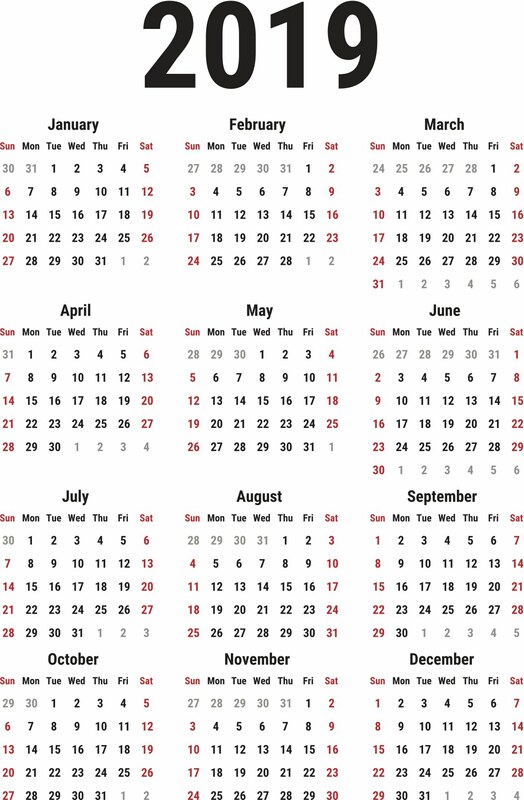 Welcome to Norecopa's second newsletter in 2019. Please share this with your colleagues and friends! Norecopa's accounts for 2018 have been approved by Norecopa's accountant. The accounts show a surplus of NOK 321,856 at the end of the year. This is almost entirely due to a large donation from the Nordic Society Against Painful Animal Experiments and VAT compensation from the Norwegian Gaming and Foundation Authority, which were received late in the year, in December 2018. This result, the promise of a further large donation from the Nordic Society in 2019 and unanimous support from the Norwegian Parliament during this year's budgetary debates, put Norecopa on a firm financial footing for this year. In connection with the Berlin 3R Centre meeting described below, Norecopa made a new flyer about its activity, which may be downloaded here and used freely. Norecopa's Secretary has had the first telephone conference for the process of presenting suggestions for updating the present Guidance Document on how to complete an ethics self-assessment when applying for funds from the Horizon 2020 programme. A document entitled Responsibility in the use of animals in bioscience research is also relevant to this work. Norecopa's Secretary has in recent months written three book chapters: one on the 3Rs for the next edition of the UFAW Handbook on the Care and Management of Laboratory and Other Research Animals, a chapter for a new book on fish welfare, and a chapter on planning of animal experiments for a new book on experimental design. Details of these will be added to the TextBase database on Norecopa's website as they are published. Norecopa's Annual Report for 2018 has been written, in English and Norwegian, and is currently in circulation to the Board Members for signature. It will be announced in the next newsletter. Norecopa's Annual Meeting and Scientific Seminar will be held in Oslo (Adamstua) on Tuesday 4 June. This year's meeting includes 3 guest lecturers. Dr. Jane Hurst from Liverpool University will speak on Mouse handling made easy – Reducing anxiety in mice and their handlers. Dr. Cathrine Bundgaard from Novo Nordisk will present their work on Implementing positive reinforcement training using clicker training on research animals. Dr. Henna-Kaisa Wigren from Helsinki will discuss Sleep and Circadian Rhythms: why should we care? These are three very relevant presentations, both to increase scientific validity and animal welfare. Norecopa's 3R Prize will hopefully be awarded in connection with this meeting: we have received 5 nominations for this year's Prize, and they are currently being evaluated by an external Prize Committee. Norecopa's course in collaboration with Scanbur Academy entitled Are you PREPAREd? How to design animal experiments on 19 March in Copenhagen was sold out and was a great success. All the presentations were rated as "Good" or "Excellent" by the participants. The presentations from the course are available here. For copyright reasons, we ask you not to publish this link, which is provided for personal use only. We thank Kirsten Bayer Anderson (Scanbur) for her administrative work and for her presentation on non-technical summaries, and Axel Kornerup Hansen (Copenhagen University), Birgitte Kousholt (Århus University) and Tine Larsen (Scanbur) for their presentations. We expect to offer the PREPARE course on demand in the future, at other locations. If desired, we can tailor the course to local needs. Please contact Scanbur Academy if you or your colleagues are interested in this. Representatives from over 15 European 3R Centres met in Berlin in the middle of March to exchange ideas and investigate areas for further collaboration. The meeting was a follow-up of an initiative during the EUSAAT congress in Linz last year, and was hosted by the German 3R Centre BB3R (Berlin-Brandeburg Research Platform). A report was written by representatives of the Swedish 3R centre, whose Annual Report for 2018 has recently been published. Norecopa has constructed a simple overview of the European 3R Centres of which we are aware, using an easy-to-remember address: norecopa.no/3REurope. We will be adding more text to each Centre as this is supplied to us by the Centres. Interest for the PREPARE guidelines for planning animal research continues to increase, and this is fuelling increased interest for the whole of the Norecopa website. At the present rate, Norecopa.no will have had a quarter of a million hits by the end of this year. Since the last newsletter in January, Norecopa's Secretary has presented PREPARE in Tromsø, Berlin and Gothenburg. The PREPARE checklist will probably not be changed in the foreseeable future, because we believe we have addressed all the major topics for planning animal research. However, we are updating the webpages for each topic continually. For example, we have just added a page on group housing of rodents with cranial implants. This is a topic about which there are few scientific publications, so we have collected anecdotal evidence from members of the CompMed discussion forum. We welcome input to this and other resources on the website. These can be sent to post@norecopa.no. The UK Home Office has updated its guidance on writing project licence applications. 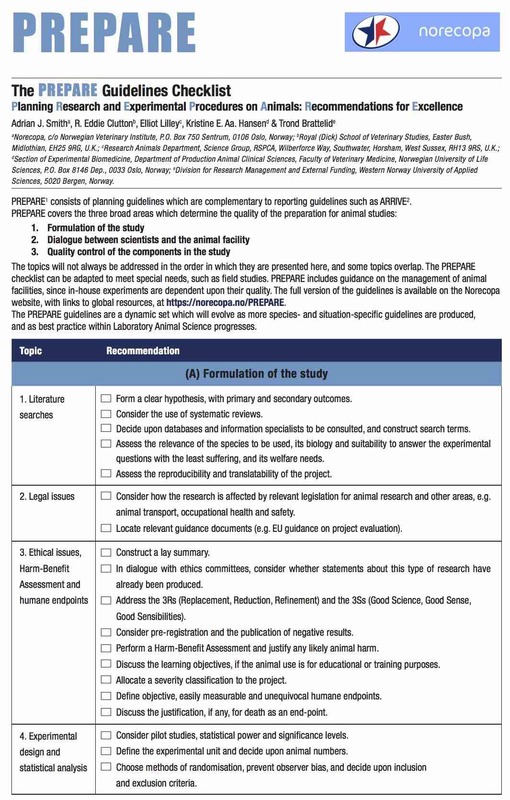 Their template for applications specifically mentions PREPARE as guidance for planning animal research and testing (point D7.9). 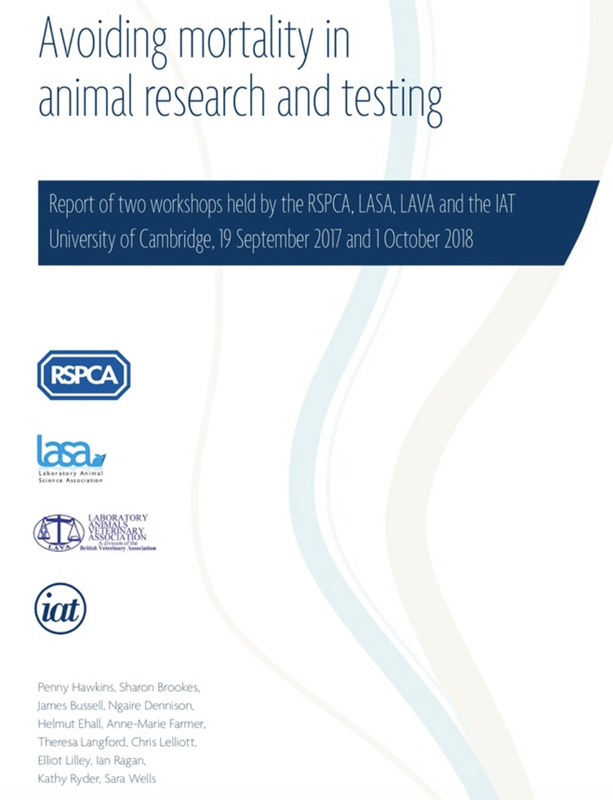 The RSPCA has published an 18-page report from two workshops, held by the RSPCA, LASA, LAVA and the IAT at the University of Cambridge in September 2017 and October 2018. The workshops focused on mortality since under EU and UK law actual severity is assumed to be severe if an animal is found dead in its cage when undergoing a scientific procedure and the death is likely to be due to the procedure, unless an informed decision can be made that severe suffering did not occur before death. The report includes both ways to reduce the number of animals found dead, and also challenges perceived scientific or regulatory requirements for death as an endpoint. The RSPCA have also updated their website with Focus on severe suffering. The FELASA Working Group on Severity Classification in Zebrafish wishes to get a better overview of procedures used in zebrafish, and how they are currently classified in different countries in Europe and worldwide. The Group has constructed a questionnaire on the subject, which should take 5-10 minutes to complete. Please help them by doing this if you work with zebrafish, or by forwarding the link to colleagues. 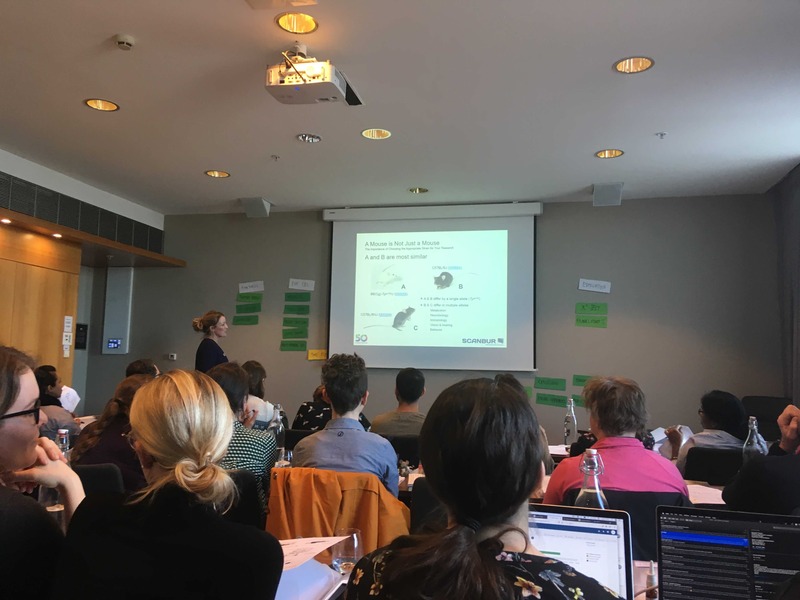 The aim of the working group is to identify current use of zebrafish and to propose guidance and examples to help with the procedural severity assessment in both adult and larval stages. The UK organisation FRAME regularly arranges Training Schools in Experimental Design and Statistical Analysis. Norecopa hosted such a School in Voss in 2016. 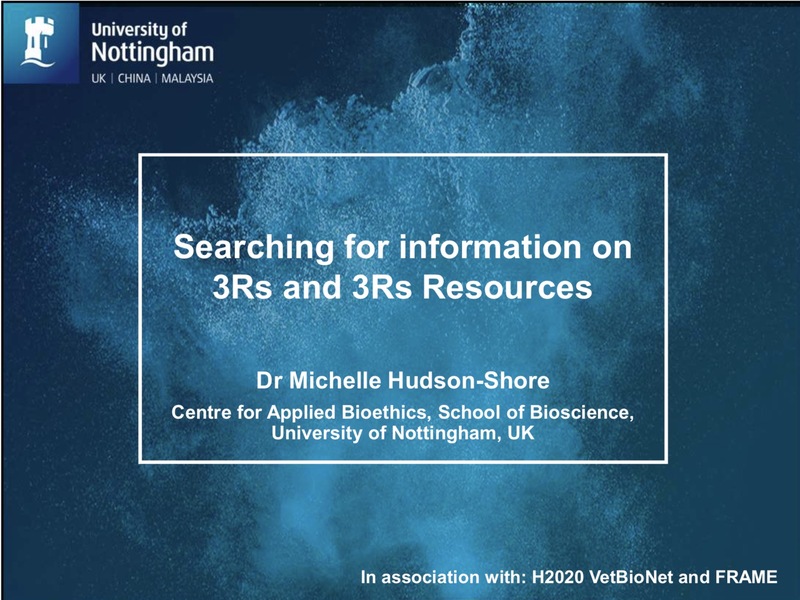 One of the organisers, Dr. Michelle Hudson-Shore, has a presentation at these Schools on Searching for information on 3Rs and 3Rs Resources. Norecopa has obtained permission to publish the presentation which she used on the most recent School, in Nottingham in January 2019. 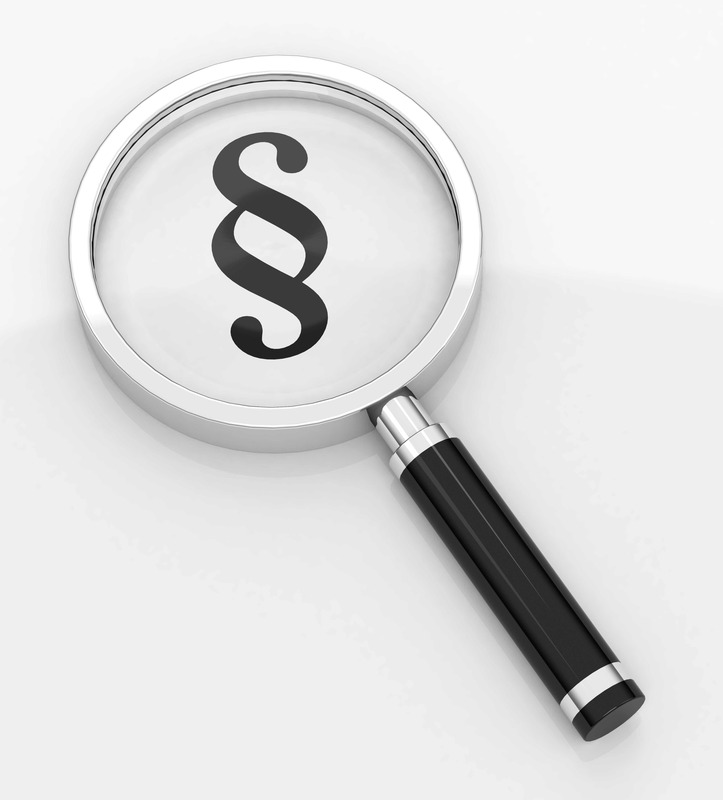 The presentation gives an awareness of the need to conduct effective searches and the problems associated with searching, as well as basic search skills and increased knowledge of available resources. More details and the presentation, are available here. Global 3Rs Awards programme for this year. The awards recognize significant innovative contributions toward the 3Rs of animal research to advance ethical science, by any researcher in academia or industry, in any area of biology. Up to four Global Awards (North America, Europe, Pacific Rim, and the Rest of World) will be presented in 2019 to the amount of $5,000 (USD) each. Award nominations should be based on a primary research paper that advances any of the 3Rs and is published in a peer-reviewed journal in the last three years. The deadline for nominations is 4 p.m. EDT on 1 June. The Danish 3R-Center has awarded money to three new 3R projects in 2019. Every year 1.5 million Danish kroner are allocated for this task. This year's support goes to: the impact of shelter enrichment of metabolic cages in studies of protein metabolism (Helle Nygaard Lærke, Aarhus University); Genetic modification of mice without the need for extensive breeding (Per Svenningsen, University of Southern Denmark); and Investigation and analyses of internal validity in Danish preclinical research (Birgitte S Kousholt, Aarhus University). The Center has also commissioned educational material about animal research and the 3Rs, both for use in secondary school (8th-10th grade) and for Biology and Biotechnology classes in High School. This material is at present only available in Danish. The Center also produces three newsletters a year, with news from both Denmark and abroad, and frequently publishes news items on its website, in English as well as Danish. The EPAA has announced that it will support students doing outstanding work on alternative approaches who wish to attend a high-profile scientific event. Three events have been selected this year: the FELASA, EUSAAT and EUROTOX congresses. FELASA celebrates its 40th Anniversary this year, and in that connection has given four special Anniversary Awards, for outstanding contributions to Laboratory Animal Science. We congratulate Werner Niklas, Patri Vergara, Camilla Bengtsson & Maria Eriksson, and David Anderson, on these awards, which will be presented at the FELASA congress in Prague in June. The Scientific Committee of next year's World Congress on Alternatives to Animals in the Life Sciences has now been established, and a call opened for proposals for sessions. A report is now available from a workshop on the use of amphibians in research held in London i October 2017. Scientists at Cornell University have developed a technique called radio frequency near-field coherent sensing (NCS) to measure the ECG of conscious animals without touching them. Scientists at the Norwegian Institute for Nature Research (NINA) have developed a method using measurement of environmental DNA in water to identify the fish species present. This avoids the need to stress fish by capture. The technique is described here in Norwegian (a full report is available here, also in Norwegian). The February issue of the journal Animal Welfare contains many interesting papers, including discussions of animal boredom and its effects, biomarkers of biological age, evaluation of the welfare of individual farm animals, and harm-benefit assessment. Likewise, the February issue of Laboratory Animals contains papers on, among other topics, harm-benefit analysis, guidelines on statistics, prevention of pup mortality by environmental enrichment and advice on orotracheal intubation of mice. Norecopa maintains comprehensive lists of journals and organisations that offer alerting services, and those that maintain email discussion groups of relevance to laboratory animal science. The UK Research Integrity Office (UKRIO) has published a primer document on research integrity in animal research. It focuses on responsible conduct, good governance and ethical oversight of animal use in research. The primer complements existing UKRIO guidance referencing animal use in research, as well as the Animals (Scientific Procedures) Act 1986 and guidance regulating the use of animals in scientific procedures. 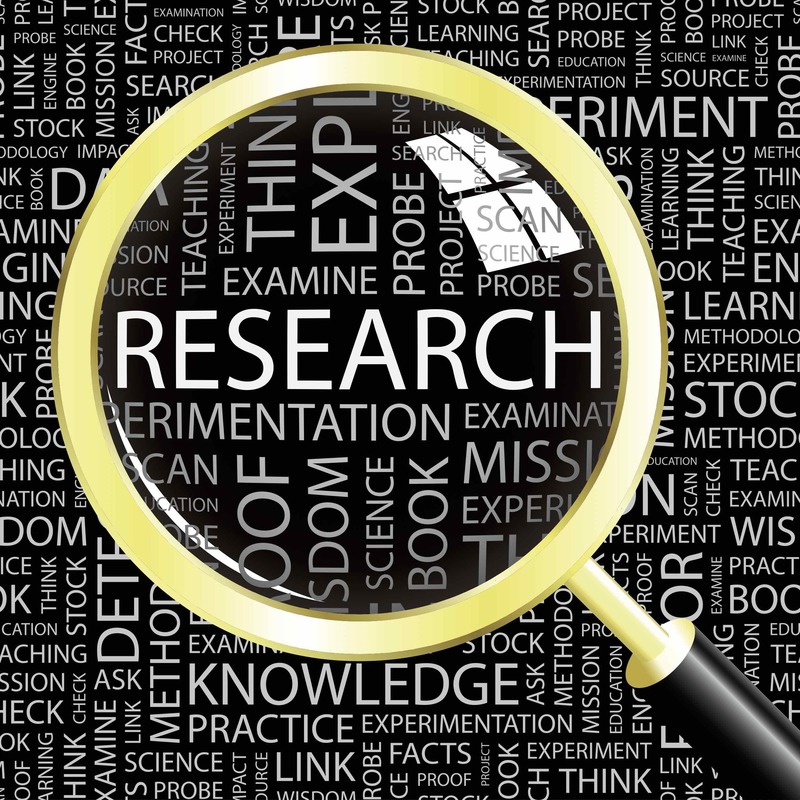 It is intended to provide research ethics committees, research staff, and those in research support, research integrity or governance roles with an overview of issues that need to be considered to facilitate a robust approach to good practice in the context of research involving animals. The document is relevant to all research involving the use of live animals, biological materials derived from animals, or animal-derived data. This is because the scientific, ethical and welfare concerns that have underpinned the development of good practice guidelines and standards in this area apply irrespective of legislative requirements. Johnny Roughan and Tatum Sevenoaks at Newcastle University have studied the welfare and scientific considerations of tattooing and ear tagging in mice. Ear tagging is generally perceived as less stressful than tattooing. However, ear tags are more difficult to read and can fall out, and mice usually require restraint for the tag numbers to be read accurately. Tattooing was not more painful than ear tagging but caused significant tail inflammation and more agitation and anxiety. However, all tattoos were read correctly without handling. They conclude that the total costs associated with tattooing are not substantially greater than for ear tagging. This paper is one of many that are cited in the section on Experimental Procedures in the PREPARE guidelines. Scientists have recently engaged in a lively debate about the use of p-values in describing the statistical significance of research findings. Valentin Amrhein and colleagues describe how Scientists rise up against statistical significance. A Nature Editorial comments this, and cites a series of articles published by the American Statistical Association. Indeed, the value of "negative results" is emphasised in, for example, the journal Translational Behavioral Medicine. Katherine Sloman and colleagues have written a paper entitled Ethical considerations in fish research. Anthony Deakin and colleagues show that the complexity of movement in zebrafish is altered when they are subjected to invasive procedures. The Dutch 3R Centre and animal welfare bodies have produced a Guide to Continuing Professional Development in Animal Experimentation, in Dutch and English. Published in 2017, Pierre-Luc Germain and colleagues have written an interesting insight into The European politics of animal experimentation: From Victorian Britain to 'Stop Vivisection' (the latter referring to the European Citizens Initiative to repeal Directive 2010/63 and effectively phase out animal research). The paper analyses, among other things, the authority and accountability of science in the debate. Norecopa has a collection of links to papers on the ethics of animal research. Christian Nawroth and colleagues have written a review paper entitled Farm Animal Cognition - Linking Behavior, Welfare and Ethics, where they point out that it is necessary to understand not only their behavioural but also their cognitive needs and capacities when assessing welfare. The Editor of ALN Magazine has written an article about Transparency in Animal Research. Cathy Schuppli at the University of British Columbia has recorded a webinar entitled Superstar Rats Teach Empathy to Researchers, which she describes as a novel approach for promoting compassion among researchers, and at the same time reducing stress in the rats. Maurice Whelan and Valérie Zuang of EURL-ECVAM explain why finding alternatives to animal testing can be a 'win-win-win' situation. In a paper entitled Recent efforts to elucidate the scientific validity of animal-based drug tests by the pharmaceutical industry, pro-testing lobby groups, and animal welfare organisations, Jarrod Bailey and Michael Balls claim that there still remains no published evidence to support the current regulatory paradigm of animal testing in supporting safe entry to clinical trials. Stina Oredsson and colleagues ask What is meant by animal-free research? We have added links to papers about the disturbance to wildlife of unmanned aerial vehicles (drones), which are increasingly being used in wildlife research. 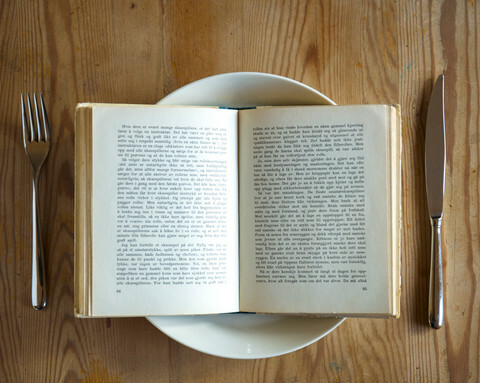 In reward for reading this far, we offer an article giving six easy ways to manage your time better. In our previous newsletter, we reported that Kathrin Herrmann and Paul Flecknell had conducted a retrospective review of the application of humane endpoints and humane killing methods in animal research proposals sent to the German authorities. They concluded that, when the investigators included humane endpoints in their application, these were often lacking in detail and/or were to be implemented at a late stage of suffering. In addition, the choice of method to kill the animals could be improved in the majority of the applications. The authors recommend greater use, and publication, of such retrospective reviews. It has been pointed out to us that the data presented dates back to a survey made in 2010, long before the implementation of EU Directive 2010/63 into German Law in August 2013.